Big news today for Monster Hunter fans! Capcom, acting on community feedback, are working on a patch for Monster Hunter 3 Ultimate for the Wii U that will add cross region servers for online multiplayer between North America and European servers, as well as the ability to have off-TV play. These were among community members' top requests, and it's awesome to see Capcom listening and responding. This patch will be released roughly a month after the game's release in March. These features will be added to the Wii U version only, because the 3DS version, well, it doesn't really do online multiplayer, nor does it do off-TV because it's already off your TV now, isn't it? Monster Hunter 3 Ultimate hits stores on March 19th in North America, and March 22nd in Europe. Day 1 digital eShop availability was also promised in today's news. Not news: we have ears... and listen to community feedback. Off-TV play: Adding more to the good news package, the update will also give you the ability to play Monster Hunter 3 Ultimate solely on the Wii U GamePad screen, with the Off-TV support. This was one of the first requests I heard when we announced the game, and I'm glad we can finally deliver upon it. So look out for Monster Hunter 3 Ultimate as it hits the shelves on March 19 (North America) and March 22 (Europe), with a day-1 digital release on the Nintendo eShop for both territories! Posted on February 28, 2013 by Eugene Huo and filed under News and tagged capcom monster hunter off-tv online region. Bill Trinen recaps what Nintendo CEO Satoru Iwata shared in the Japanese Nintendo Direct recently: Nintendo Network and ID; Miiverse; and the Internet Browser. One of the interesting things he notes, is that players from around the world will be showing up in the Nintendo Land Plaza, and that even though you may not be able to understand their language, you can communicate through drawings, that anyone can understand. I never thought of drawings as the universal language, but I guess it works. Also, at 14:01 in the video... priceless. Posted on November 13, 2012 by Eugene Huo and filed under News and tagged WiiU internet network online. One of the things I most liked about the Wii was the Wii Shop Channel. Classic games from my childhood on the Virtual Console, and new quirky games on WiiWare? What's not to love? Posted on November 12, 2012 by Eugene Huo and filed under Countdown and tagged DLC WiiU downloads eshop online. So I'm counting down the days till my Wii U gets here, and what better way to make the wait go faster than by talking about the things I'm most looking forward to, right? Today it's TVii, Nintendo's new media centre idea that was totally under the radar until they announced it in New York back in September. It was an Apple-esque achievement, keeping TVii a secret. What is the promise of TVii? Well for starters is the idea that your Gamepad will be a glorified remote control, allowing you to change channels, volume, etc. on your TV, no matter the brand. That is at its most basic level, however. 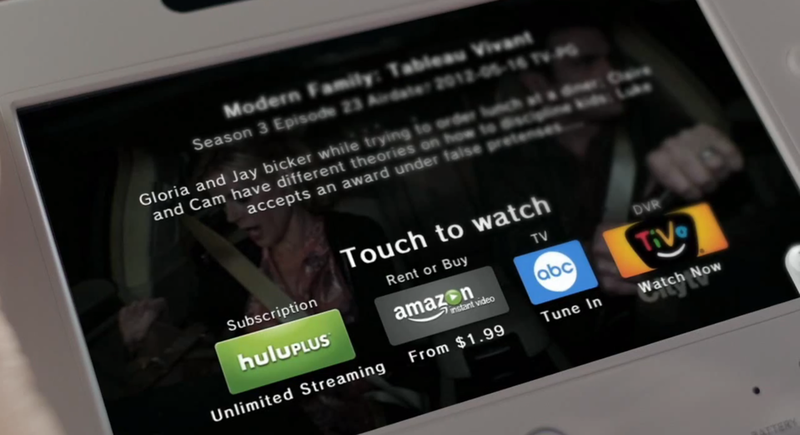 The really interesting part is the integration of online services and, if you have it, a TiVo box into the mix. Nintendo TVii hopes to offer the user a level of abstraction from stations and networks, and instead lets you focus solely on "what do I want to watch?". Type that in, and TVii will bring up that show or movie, and let you know where it's available for you to watch or rent, whether it is Netflix, Hulu, amazon, or recorded on your TiVo, or showing live on TV. Netflix is huge for me, and even though I have a HTPC I think I will use the Wii U instead if it has a nice interface and search built in. There is a social component to it as well, which is supposed to allow you to recommend shows to your friends, comment on a scrolling timeline of the show as it's happening, and get sports updates in real time. It's all very ambitious, and the big question is whether it will all work. Personally, I can't wait to find out! Posted on November 9, 2012 by Eugene Huo and filed under Countdown and tagged TVii WiiU entertainment netflix online shows watch. Posted on November 7, 2012 by Eugene Huo and filed under News and tagged WiiU details miiverse online. Should we be concerned? The Wii U launches in less than 2 weeks, and we still don't know much about the online aspects of the console. Iwata has said that he would like to talk about Miiverse in an upcoming Nintendo Direct, so hopefully that will clear up the 'fog of vague' that surround the Miiverse and the Wii U's online functionality. So far we know that Miiverse will start at the same time as the Wii U launch, that it includes some kind of plaza where your Mii congregates around games that you are playing, and that there are some chat and note functionality. no more friend codes, right? how will it handle usernames? will one Wii U system handle multiple users? will there be Club Nintendo integration? eShop? Wii accounts? can we unify them all into one Miiverse account? what is the extent of the mobile devices support? sounds like Miiverse is a social network, what about multiplayer matchmaking? leaderboards? can you access the Miiverse from your computer (i.e. through the web)? achievements? accomplishments? how will they work? Please Nintendo, we need to know! Posted on November 5, 2012 by Eugene Huo and tagged Iwata WiiU miiverse nintendo online. In a sarcastic post, Kotaku's Jason Schreier blasts ABC Local News for a story warning parents that when playing games with online interactions, your kids might be exposed to language and content that are definitely not kid-friendly. ABC Local is on top of its game this week, warning the world that, according to experts, there is cursing on Xbox Live. And racial slurs! And cyber-bullying! While it may be obvious to gamers that online interactions are laced with profanity and racial and sexual slurs, many parents are unaware of what happens when a game has an online chat component. Because none of this happens, on, say, a playground. Or at school. Or anywhere that 11-year-old kids hang out because this is what 11-year-old kids do. Sure, it happens. But it doesn't happen without consequence. Kids get expelled, parents get called in, a lot of things happen if a child behaves inappropriately at school. And just because it happens elsewhere, does it mean it's ok? And surely schools aren't allowing adults to come to the playground and taunt the kids, are they? Yet that's what could happen online, because online game chat is open to everyone and anyone. The ABC article does give some good tips, namely, be involved in what your kids are doing, no gaming in their bedrooms, that sort of thing. It also highlights the work that Microsoft is doing on Xbox LIVE to look out for bullying and predatory behaviour. Remember the target audience for this article is not us, the gamers and gamer parents. We already know this stuff. It's for the average mom and dad who don't know, and who need to know. Parents need to be more informed, not less. Posted on March 28, 2012 by Eugene Huo and tagged chat kotaku language online parenting.